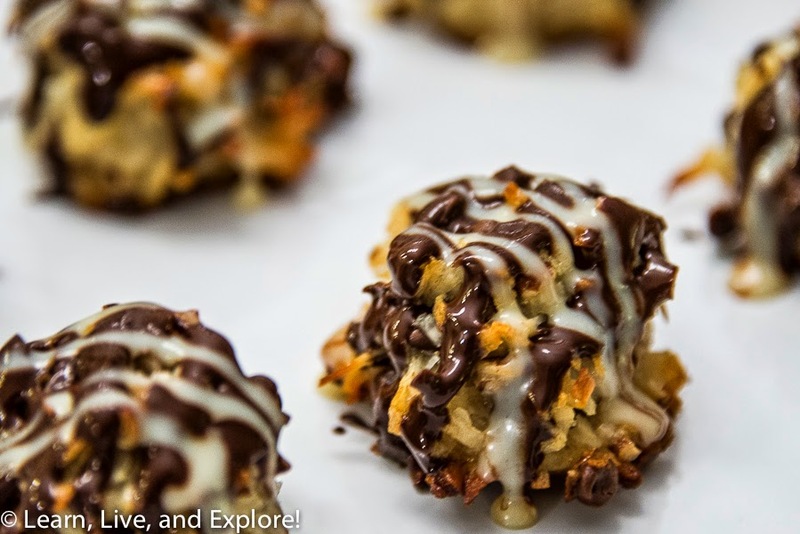 German Chocolate Macaroons ~ Learn, Live, and Explore! Sometimes I just get a craving for german chocolate cake, but don't want to go through all the fuss of making an actual cake or even cupcakes. I love macaroons. Logically, I wondered what would happen if I added a few more flavors to my original coconut macaroon recipe to evoke the flavors of traditional german chocolate cake recipes - basically add pecans and chocolate. The end result was pretty yummy and very easy! Mix together in a bowl the coconut, egg white, vanilla, condensed milk, pecans, and chocolate chips. Cover a baking sheet with a silicone sheet or parchment paper. Press together 1 inch balls of the coconut mixture and place on the baking sheet. Bake 18-20 minutes on the top shelf, monitoring to ensure the coconut doesn't burn. Melt german chocolate in the microwave, then drizzle on the macaroons with a spoon or use a squeeze bottle. Repeat the drizzling process for the sweetened condensed milk.